Nothing changes a room so quickly and dramatically as a fresh coat of paint! If you have decided to freshen up your space, save yourself time and ensure a beautiful finish by hiring reputable interior painters like Paint Pals of Fort Collins. As experienced professional painters, we have the knowledge, tools and skills to transform your home in just a few days! Scale: If you are planning to change the color of just one isolated room, you won’t need to consider how the surrounding areas relate as much as when painting an open-concept space or entire level of your home. One tip is to always plan on a fresh coat for the ceiling as well because they often end up looking dingy when the wall color is new. Color: This step in paint selection is the most time-consuming and can be overwhelming with so many colors to choose from. To ensure that you’ll be happy with the finished product, take the time to tryout several samples in your space. First, tape chips on the wall and take a few days to see which keep drawing your attention. Then actually apply a few samples, but be sure to prime beforehand so the sample is not affected by the old color. It’s also a good idea to choose a lighter shade and a darker one to test which works better with the changing light throughout the day. Finish: A flat finish hides flaws the best but is not easily cleaned, so it’s best suited for less-used areas. 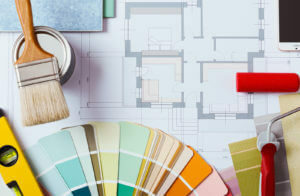 Eggshell is the most popular finish for most rooms because it is not too shiny and endures multiple wipings. Semi-gloss is even easier to wipe than eggshell but due to its sheen, is best used on trim and woodwork. The least applied finish is gloss, really only suitable for trim that is exposed to higher moisture levels. Type: The last decision you’ll need to make is whether to use latex or oil-based paint. For most areas, latex will probably make more sense because it dries faster and doesn’t yellow with age. It is water-based versus oil-based, which means there is less odor during application and clean up is easier. Oil-based paint also takes longer to dry but levels out while drying to hide brushstrokes better. Oil-based paint may be preferred for woodwork for its smooth finish and because it is more durable than latex. When looking for superior interior painters in Fort Collins, look no further than Paint Pals- we have hundreds of satisfied clients that can confirm our reputation for beautiful interior paint jobs!